First round of Division III tournament features contrasting styles in Biddeford on Saturday night. 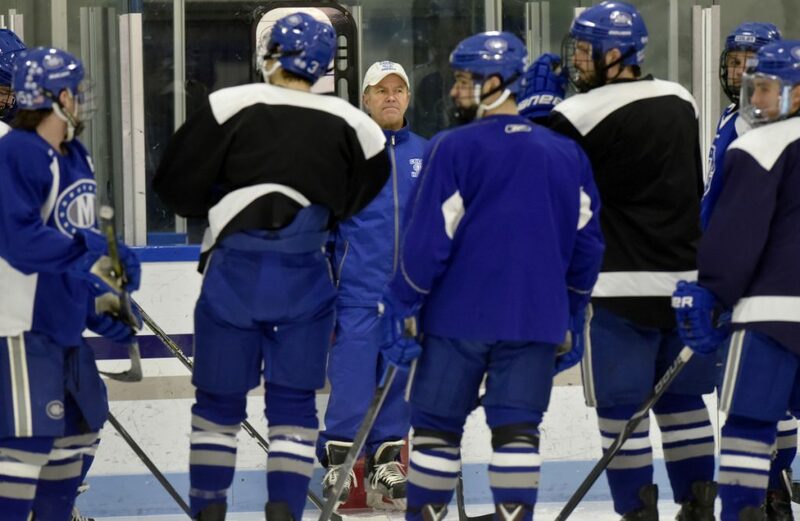 WATERVILLE — When the NCAA announced the participants in its Division III national hockey tournament via a webcast Monday morning, the Colby College and University of New England teams had very different reactions. For Colby, it was the validation of a program first. A win in the New England Small College Athletic Conference championship game assured the Mules one of seven berths in the 12-team bracket reserved for conference champions. Colby: Won first NESCAC tournament in program history to earn tournament berth… Has gone 5-0-2 over its last seven games… Making first NCAA appearance since 1996… Led NESCAC with 3.41 goals per game as a team… Goalie Sean Lawrence ranks third nationally with .940 save percentage… One of only four teams in Division III to average fewer than eight penalty minutes per game. UNE: Making first NCAA appearance in program history as an at-large selection… Leads nation with 139 goals scored as a team. … 51 of the Nor’easters’ 139 goals (36.7 percent) came via the nation’s most effective power play… Despite a prolific offense, UNE has allowed the opposition 3.39 goals per game. Who to watch: Colby — RW Phil Klitirinos (8-18-26), LW Cam MacDonald (15-8-23), D Michael Decker (3-16-19), C Nick O’Connor (11-11-22), G Sean Lawrence (2.06 GAA, .940 save pct. ); UNE — F Brady Fleurent (16-34-50), F Tyler Seltenreich (19-15-34), F Ryan Bloom (28-18-46), D Ryan Burr (5-21-26), G Ben Churchfield (3.26, .906). For UNE, it was relief. After spending nine consecutive weeks ranked inside the nation’s Top 15 — climbing as high as No. 4 — the Nor’easters lost to Nichols in the Commonwealth Coast Conference championship and needed one of only five at-large bids to qualify for the program’s first NCAA appearance. If the seventh-ranked Nor’easters (20-5-3) have proven anything this season, it’s that they have the firepower to rebound. Leading the nation in total goals (139), UNE scored six or more goals 13 times this season. Only once this season did the Nor’easters lose back-to-back games. Five different players have scored 10 or more goals this season for UNE, led by freshman Tyler Seltenreich’s 19. Junior and Biddeford native Brady Fleurent is one of only two 50-point scorers in the nation this season with 16-34-50 totals. Twice UNE played Colby during the regular season, beating the Mules 5-3 and 5-1 in non-conference games in early January. Those losses came during a stretch in which the Mules lost six out of seven games. Colby (15-10-2) is a much different team than the one the Nor’easters handled with ease. The Mules are unbeaten in their last seven (5-0-2), having knocked off nationally-ranked Trinity twice during that stretch. After allowing 27 goals over a seven-game stretch in January which included the UNE losses, Colby has allowed just 22 goals in the 12 games since (8-2-2). Senior netminder Sean Lawrence — who didn’t play in either UNE game this season — made 113 saves over the course of three NESCAC playoff games and carries a 1.12 goals against average over his last seven starts. If the Nor’easters place emphasis on being an offensive juggernaut, the Mules focus on what they’re doing in their own end. “The scoring goals part and the goaltending part of things — both can come in waves,” Colby senior defenseman Dan Dupont said. “Sometimes goal scorers just aren’t scoring, and that’s OK. The important thing is when you’re in that drought (like in January) — what we did, we stuck with our same process and trusted that process. We knew eventually our goal-scorers will score and our goalie will be a brick wall. Colby head coach Blaise MacDonald, who has 301 career wins at Colby, UMass Lowell and Niagara combined, likes where his Mules are at. In a one-game playoff scenario, MacDonald looks at controlling what the Mules can control. The difference between advancing or heading home is in the details. “What I firmly believe in these big games is that it’s not the spectacular plays. It’s not the highlight plays,” MacDonald said. “It’s the team that executes the little fundamental simple things the best that wins. It’s faceoff coverage. It’s backchecking. It’s playing with your stick on the ice.